One of the earlier projects I worked on at Constant Contact was an initiative to explore options around allowing teams to collaborate in product. The idea was that many customers were paying for accounts and then sharing their credentials with employees or volunteers who would then use the product for a variety of purposes. The were significant customer requests for allowing others to create credentials and managing the security access for the various sub-accounts. Due to technical restrictions and UI complexity, we agreed early on to provide a small set of account roles--each with its own rules and restrictions. The design team decided to explore how various roles might interact with one another and the sorts of calls required by the system to support them. Ultimately technical restrictions proved to be too limiting to offer more than one user role with restricted permissions. We worked to provide visual designs for the "Add a new user" page. 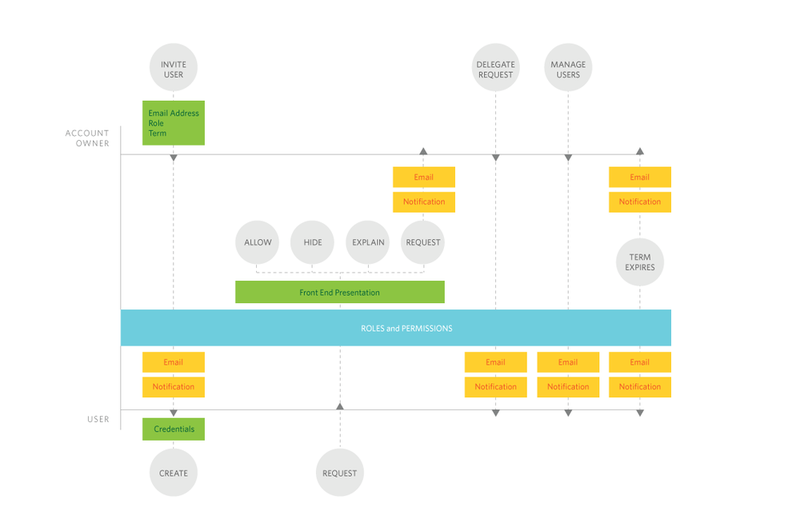 This is a sample flow for a multi-role team within the product. The campaign creator copies an existing campaign to create a new one, and edits/previews until satisfied. A more advanced role would have the option to send campaigns out to a select audience. Supervising roles could jump in at any point to review content and analytics. This map shows all the required and optional steps within a create-edit-preview-schedule-send flow and the limits applied to the various roles.